IRFW1 19” Floor Standing Welded Construction Racks have been designed as a turn-key solution to meet industry standards while providing the flexibility required by specific IT and custom AV installations. Updated design features allow for reversible left and right opening doors and universal accessory ‘plug-in’ options such as: Fan, Brush, Blanking plate and PDU’s* can be fitted to the rear or front 19” uprights or the top/ bottom 19” securing nuts. 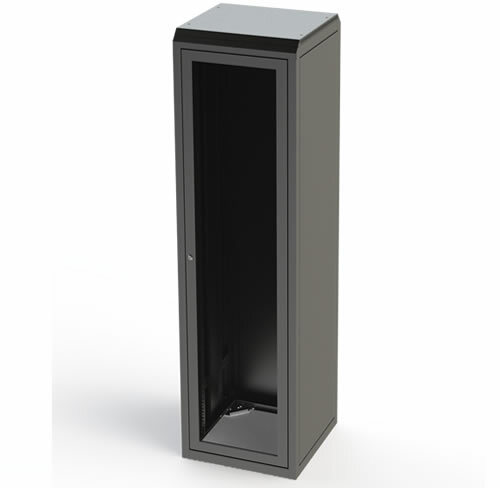 A comprehensive range of standard U sizes, depth configurations and door configurations can be selected per job by the installer allowing each rack to be uniquely tailored to each jobs specific requirement.